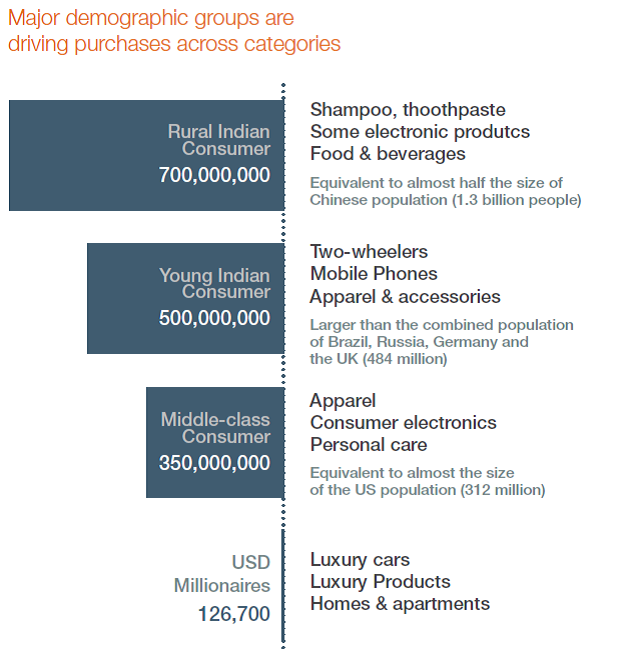 India’s rising middle class is ensuring that it is emerging as one of the world’s leading consumer markets. Estimated at US $ 991 bn. in 2010 total consumption expenditure is expected to grow to US $ 3.6 trillion in 2020. Food, housing, consumer durables, transport and communication will be the top contributors. The FMCG sector alone is expected to grow at a base rate of 12.5% annually to become an INR 4000 bn. industry by 2020. The Indian retail sector is the fifth largest in the world, and accounts for 14-15% of the country’s GDP. The industry size is expected to more than double from US$ 450 billion to US$ 1.3 trillion by 2020, propelled by an estimated 25% average annual growth in organized retail. India is ranked 46th and lags behind countries such as Japan, the United States, Germany and China according to the World Bank’s 2012 Logistics Performance Indicator. Logistics spends account for around 6-10% of average retail prices in India as against the global average of 4-5%. Therefore, there is a clear scope to improve margins by 3-5% just by improving the efficiency of the supply chain and logistics processes. Massive investment pouring in infrastructure will also usher in a revolution in Supply Chain and logistic industry. To service such a growing market and a vast expansive geography process, cost and time efficiently the supply chain and logistics sector is expected to play a pivotal role. Call us optimistic, but we believe we want to take that dream one step closer to realization. SCNext India is affiliated to SCNext USA, the Young Professionals arm of International Supply Chain Education Alliance, USA. We welcome you to SCNext India a knowledge sharing platform that will bring Supply Chain Education and activities to University / B-Schools students and Supply Chain Young Professionals. The Platform will catalyse university activities and link students and Young Professionals to the experience and expertise of SCNext mentors – industry thought leaders and industry at large in a holistic way. SCNext in its quest to groom student leadership in India has taken a quantum jump by announcing Campus Ambassadors. They lead exemplary initiatives in academic initiatives in Supply Chain training and Events management, at India’s contemporary B-Schools. A global facilitator, World Trade Center Pune offers world-class facilities and infrastructure and provides an opportunity to grow and foster international business. Members can access these services at all operating WTCs around the world and belong to an elite group consisting of 750,000 international companies. Located in the eastern part of Pune in Kharadi, WTC Pune is located strategically to foster international trade by providing various services and facilities designed specifically to meet the needs of participants in global commerce. India-US relations have become increasingly broad based covering cooperation in areas such as trade and economic, defense and security, education, science and technology, high-technology, civil nuclear energy, space technology and applications, clean energy, environment and health. The purpose of the USIIC is to provide Indian companies many services including tie up with American companies, import guidance, product and service identification in the US and assistance in finances from US Exim or ECB’s. At the same time, for American companies wishing to make a foray into India, it provides many services like local tie-ups, exports to India, information on taxes, duties and all local India regulations.